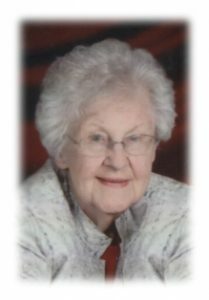 Joan M. Bley, age 92 years, died at her Port Washington residence August 8, 2018. Joan Margaret Hames was born in Belgium to Conrad and Helen Gilles Hames on December 27, 1925, during a blizzard that prevented her mother from going to the hospital; the doctor arrived by snowplow to assist with her birth. Her father ran the general store in Belgium, where she grew up in a close family and made lifelong friends. As a young adult, she picked vegetables for the local canning factory and remembered working alongside German POWs. She graduated from Port Washington High School in 1943, then went to work in the office at the Allen Edmonds Factory in Belgium. She corresponded with her future husband, Leroy, who was a Navy Seabee in World War II. They married on July 3, 1948, and recently celebrated their 70th wedding anniversary. The Bleys were well known for celebrating their wedding anniversaries with Hawaiian-themed parties. They lived in Port Washington throughout their married life, until recently in homes lovingly built by her husband. Together they raised four children who fondly remember their mother’s delicious homemade apple pies, butter horns and Christmas cookies. After her children were grown, she worked as an accountant at Tires Unlimited in Port Washington. An avid bridge player, she was a charter member of a bridge club that met for more than 50 years. The players were featured on the cover of Transitions magazine in 2010. She and her husband also played sheepshead with long-time friends for more than 55 years. In later years, she enjoyed playing dominoes and card games with her family and friends. Mrs. Bley and her husband enjoyed many years as members of The Friendship Force, which provided them the opportunity to travel around the world and stay in homes with wonderful and interesting people. The friends they made on these trips continue to this day. Mrs. Bley was also a member of the Luxembourg American Cultural Society and the Port Washington Historical Society. She was proud that a daughter and granddaughter were able to attain Luxembourg citizenship as a result of her family lineage. She was a charter member of St. Peter of Alcantara parish. She is survived by her husband Leroy of Port Washington and children Linda (Steve) Gebert of Beavercreek, Ohio; Mary Bley of Port Washington; Paul (Natalie) Bley of Falls Church, Virginia; Amy Bley of Waukesha. Further survived by grandchildren Julie (Esben) Hansen, Holly (fiancé Paul Sehzue) Gebert, Melanie Gebert, John Francetic, Eleanor Tobin Griffin; great-grandchildren Lucas Hansen, Camilla Hansen; sister Beatrice Newlun of Green Bay, sister-in law Eileen Redig of Port Washington; brother- and sister-in-law Nick and Patricia Bley of Lynnwood, Washington; brother-in-law Bob Niederkorn of Galesville; nieces, nephews, godchildren and cherished friends. She is preceded in death by brothers and sisters-in Law Wilmer and Ruth Hames and Lee and Patricia Hames; brothers-in-law Hallie Newlun, Walter Redig, William Krier; and sister-in-law Mary Ellen Niederkorn. A Mass of Christian burial will be held at 10 a.m. on Friday, Aug. 17, at St. John XXIII Parish, St. Peter’s Church, 1802 N. Wisconsin Street, Port Washington. Father Patrick Wendt will officiate. Visitation will be at the church from 9 a.m. until the service. Burial will be at St. Mary’s Cemetery in Port Washington. In lieu of flowers, the family suggests memorials to The Friendship Force of Greater Milwaukee or to Stars and Stripes Honor Flight, in recognition of the many members of her family who served and are serving in the military. Next Post: Fleischmann, Mattie L.
A wonderful and kind person, friend and neighbor for many years growing up. I remember once when Mrs. Bley was watching us when Mom went shopping and they had a tic-tac-toe game in the toy closet that I was amazing and wonderful every game. So kind to a young mind. Each time I would shovel their sidewalk (out of respect…) she would invite me in for hot chocolate and cookies. Many great memories and she will be missed.